Awesome, even if there wasn’t a bite of new Jurassic World in sight! The day has arrived for big fans of toys and collectables in the UK, and further afield too! 22nd of January 2019 marked the first day of London Toy Fair 2019. London Toy Fair, much like its US counterpart New York Toy Fair (Starting February 16th), is an opportunity for toy companies to show retailers and suppliers their latest and greatest toys for the year ahead. London Toy Fair is, by nature, a trade show – meaning that unlike Comic Cons and other events, Toy Fair is not open to members of the public. As such, news tends to trickle out from press and media outlets around this time – hinting at upcoming releases but not necessarily showing all there is to offer. Still, I had been able to obtain a media pass for a second year in the row for The Jurassic Park Podcast, so I was eager to jump in and see what Jurassic World product might be on show! Firstly, we’ll start with the big hitters in the room – Mattel, and LEGO. Firstly, Mattel traditionally do not tend to show anything to the press at London Toy Fair – instead having a show room set up for potential buyers and retailers. Now, whilst I had attempted to get in touch with Mattel so see if they would be sharing anything Jurassic, I was quickly informed that 2019 would be the same for Mattel – with the event being purely corporate. So, with this knowledge at hand, I advise you all to stay tuned in February – as I know Mattel are now doubt preparing for a killer New York Toy Fair like they did in 2018! LEGO, on the other hand, I had a little more luck with! I got invited into their waiting room where I was given a USB drive with some marketing materials on. Unfortunately, however, this was it. Similarly, to Mattel, the actual showroom with second-half 2019 materials was locked down to retailers and vetted attendees, so I was unable to gain access. Whilst the USB contained media materials which are already widely available, it was a kind gesture from LEGO – and hopefully, we will be able to share more from LEGO when they announce the LEGO Jurassic World direct-to-consumer set due to release in the second half of the year. So, with the two big hitters down and out, I wasn’t feeling confident for Jurassic World materials at London Toy Fair – and truth be told, there wasn’t much else! I did, however, check in with our friends at Funko Europe. Whilst they didn’t have anything new on show – it was nice seeing some of their existing Jurassic products out and on display proudly. In their keychain area, they had the exclusive two-pack of Owen and Blue from the Jurassic World Fallen Kingdom Blu-Ray release. Further into their booth, alongside some of their other products from various Netflix shows, and some super cute James Bond Pop! products, they had some of the Jurassic characters on show in all their glory. This was my first time seeing Claire, Owen and the Indoraptor in person – and I must admit, Funko did a really good job with these, with Owen standing out to me. Would you guys like us to review these ones? If so, let me know and we will see what we can do! Fingers crossed Funko continues to carry the Jurassic line in 2021 when Jurassic World 3 releases. At this point I realised that, unfortunately, Jurassic World really was not going to be a big presence at London Toy Fair 2019. 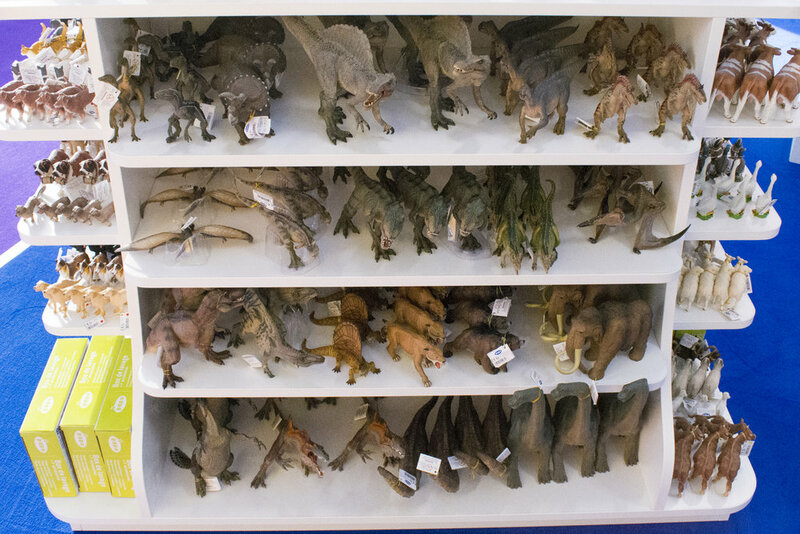 I decided to take a quick look around the show floor to unearth some of the new dinosaur goodies which will be on store shelves both in the UK and worldwide this year. The first thing I stumbled upon was a line of different products by Megasaurs. Now, ironically, when you search for their website it doesn’t come up – but these are really the bog-standard dinosaur toys that you see in a lot of independent toy retailers and shops across the country. 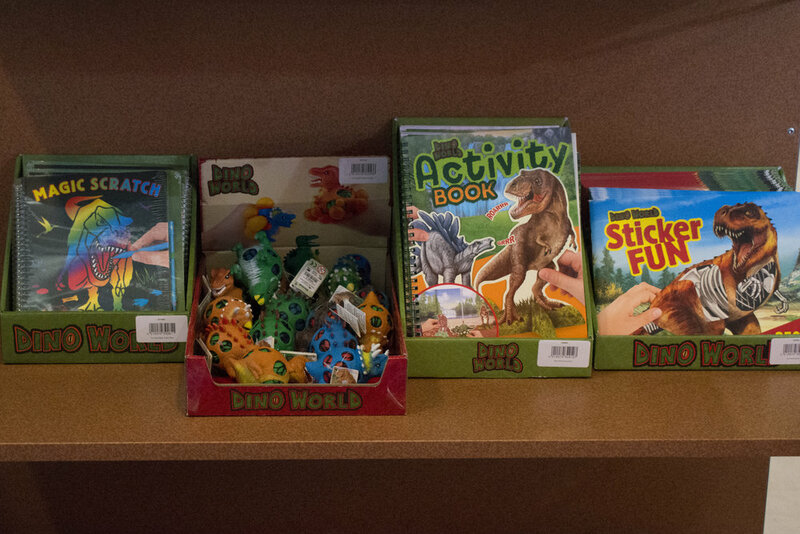 There was an assortment of different dino-tastic goodies here, from hand puppets to activities and a whole host of different dinosaurs in both individual assortments and big multipacks. These types of dinosaurs are really designed to be your low-level toys, which are affordable on a budget and are something which young children can save up for and buy on a pocket money basis. It’s nice seeing a host of different toys inspired by dinosaurs for children – inspiring children of all ages and abilities to get hands on with these prehistoric creatures, and hopefully pick up a passion for history in the process. After this, I also stumbled upon another interesting attempt at bringing dinosaurs to the mainstream toy market – ‘Dino World’. Dino World could potentially be trying to cash in on another ‘World’ we’re all fond of – but they did offer some cool products, ranging from Dinosaur-themed pens (not sure how comfy it would be to write with a Stegosaurus though, to be honest!) to stylish lunchboxes, activity books and sticker packs. Now, whilst these are not going to appeal to any of us adult collectors or fans – they are certainly a ton of fun for children. It is wonderful to see that retailers and toy producers continue to see the value that dinosaurs have – continuing to create new and innovative products which kids can enjoy. As technology evolves, we can argue that digital technology has overtaken things like stickers and activity books – so it is nice to see that dino themed variations of those still exist and are still engaging young people. This was something which was fun to see – although I would argue that it was nothing special. That, I have saved for last. There were two other stalls I wanted to check out at Toy Fair. The first, was Papo. Papo are well renowned for their incredible attention to detail, with sharp and realistic feeling sculpts creating beautiful miniature dinosaurs which look truly incredible. What companies like Mattel have in articulation, Papo instead choose to make up for in detail – providing incredibly phenomenal works of art. I was lucky enough to have the chance to talk to one of the lovely sales reps from Papo, and she was explaining how the company’s commitment is to be working on realism – so wherever possible, they aim to create dinosaurs which look as close to the palaeontological records we have of them as they can. This is visible in some of the beautiful dinosaurs photographed – such as the Carnotaurus, and the Cryolophosaurus. The sales rep explained that Papo commit themselves to accuracy – so whenever scientific discoveries are made, they try and change their products to match this. The most recent example was when changes in dinosaur patterns and colours were proven – leading to the products colour schemes changing. Papo were really cool to talk to and they make some incredibly intricate dinosaurs – so if you love the Mattel toys, you will be blown away by Papo’s offerings too! The other company I was really looking forward to checking out were Schleich – who offer very awesome and beautifully sculpted dinosaurs like Papo. 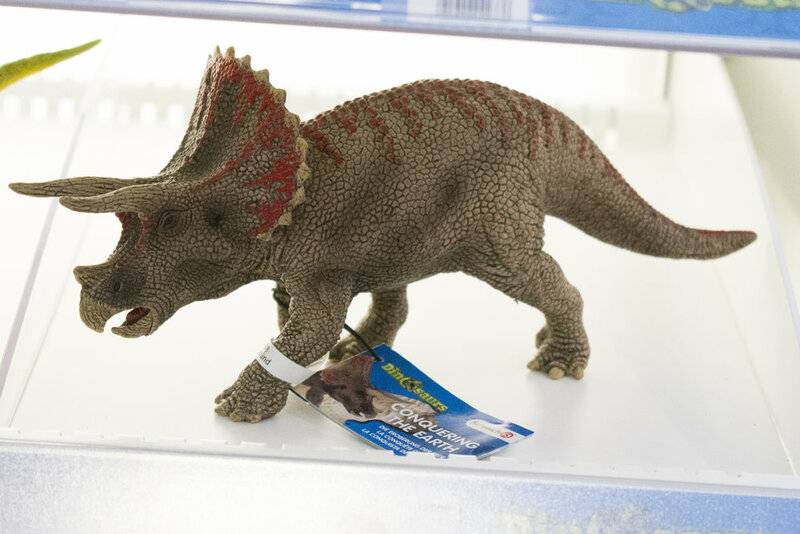 Schleich had some amazing dinosaur toys on show this year – and they were also kind enough to give me a brochure to take away which details some of their releases for the coming year. A kind sales rep highlighted some of the new products to me – including a blue Plesiosaurus which she explained was made of a bendable material to allow the long neck to get into some interesting poses. Other products included a brand new Diabloceratops, a new Giganotosaurus and a stunning Dracorex which is arguably one of my favourite dinosaur toys I have seen to date. The paint scheme was immaculate, and looked incredibly crisp and incredibly grounded in realism. This is one I am tempted to pick up! Another thing to note is Schleich offered some fantastic landscapes – including a gorgeous looking Volcano which I could see someone like Ted Brothers taking some incredible photographs with! 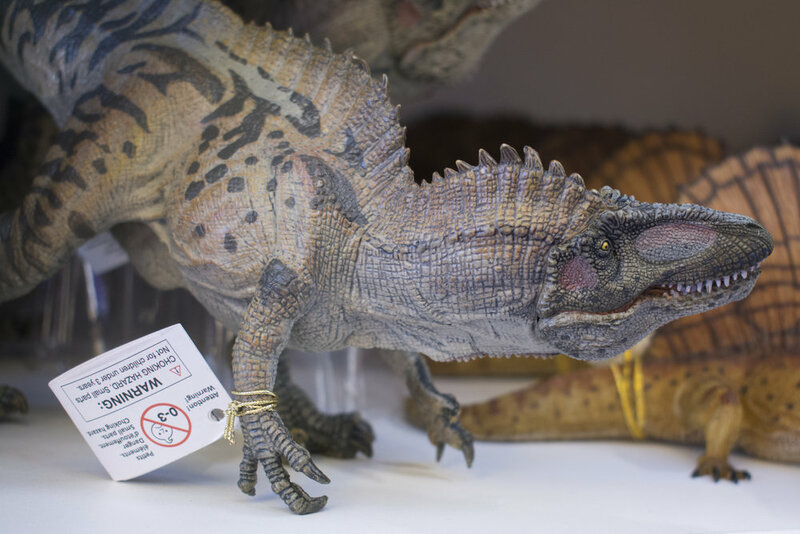 Schleich, just like Papo, really were showcasing some of the best paintjobs on dinosaur toys I have seen – highlighting how they offer beautiful, higher-end pieces which don’t break the bank and really are affordable for kids and adults alike. So, that was my day at London Toy Fair this year! To put it into Roland Tembo’s terms – we felt a lot further away from The Game Trail this year, not highlighting nearly as much cool Jurassic merchandise as we had got to see in early years. I think it was unfortunate, in many ways, that there was not much to show for Jurassic World in London. We know that Universal Pictures want to do more with this brand and want to have greater longevity for the IP – so the first start there is to encourage more buzz around it, and unfortunately this year that didn’t quite hit the mark! That said, what I did get to see was awesome. It’s always a pleasure checking out the work of Papo and Schleich, and seeing Funko was fun too. What did you think of this article? How did it match up to what we covered last year? And what do you hope New York Toy Fair will bring? As always, let us know in the comments below.